Gen Xtinct: "Magic," aka "That freaky ventriloquism movie"
I have never seen the film, and I don't really care to, but something about this ugly dummy just creeps me. Did anyone see it? Is it as scary as the preview promises? awful, weird, freaky movie. Anthony Hopkins. 'Nuff said. Yes, this movie freaked me the freak out. It is every bit as creepy as that trailer. Scary as in SCARY scary? Not really. Creepy? You betcha. Hopkins + vent dummy = maximum creepage. The rhyme in the trailer strikes me as kind of dopey, though. Movies like this made ventriloquism a scary/freaky practice. There is a new documentary coming out called Dumbstruck that I think you will either like because of the fact that it revolves around ventriloquist or you will enjoy because its so weird because its a documentary about ventriloquist. either way, check out the trailer on the facebbok website! 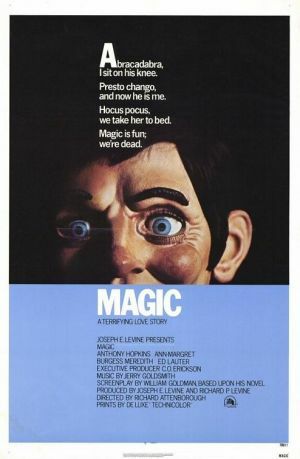 Anthony Hopkins gave a very commended performance in Magic - he actually had to take ventriloquism lessons for months to perfect the art. Made my childhood hell for years. I remember running to the bathroom when it came on. Jebus, that brings back bad memories. I finally watched it when I was in my 30s. I thought it was stupid.